Imitation may be the sincerest form of flattery, but it can often go so wrong. 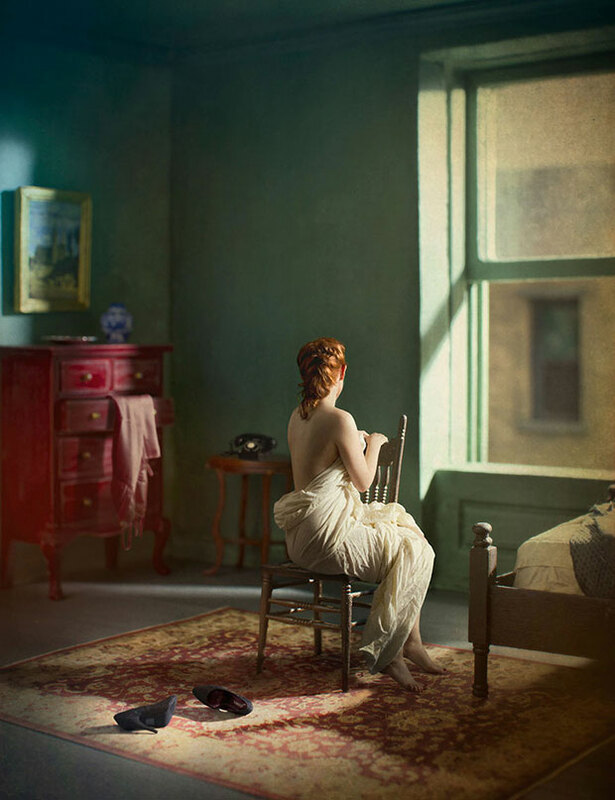 Painter, photographer, and “assemblist” Richard Tuschman, set his sights on Edward Hopper for his series Hopper Meditations, resulting in a take on and a nod to Hopper’s command of mood, composition, tone, and hue, and an ode to his vision and unparalleled singularity. The reverse of “photorealism” (what could we call that?) occurs in this series, with Tuschman’s playful take on Hopperesque scenes, replete with apartment details, cityscapes, and the unspoken malaise of a woman too beautiful to be let out of the house. We asked Tuschman for details about this tonally arresting work. 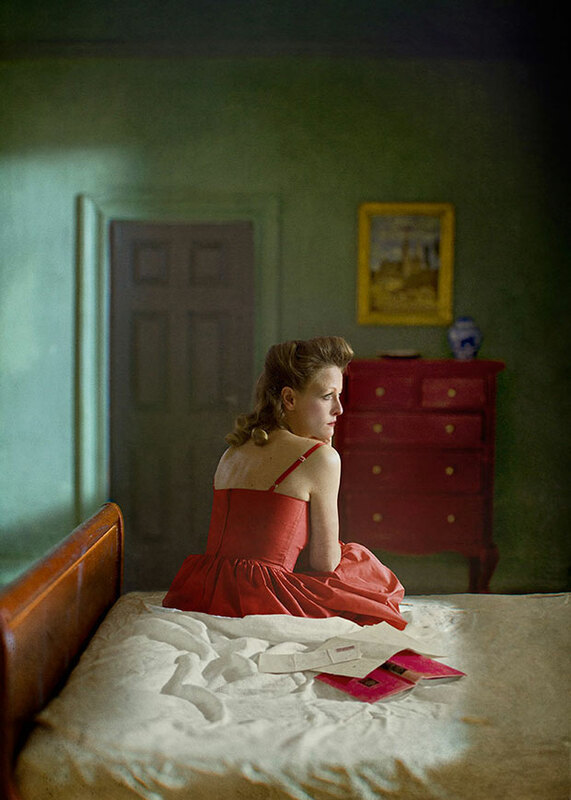 How did you want to see Hopper’s work echoed photographically? And do you have a background in painting? 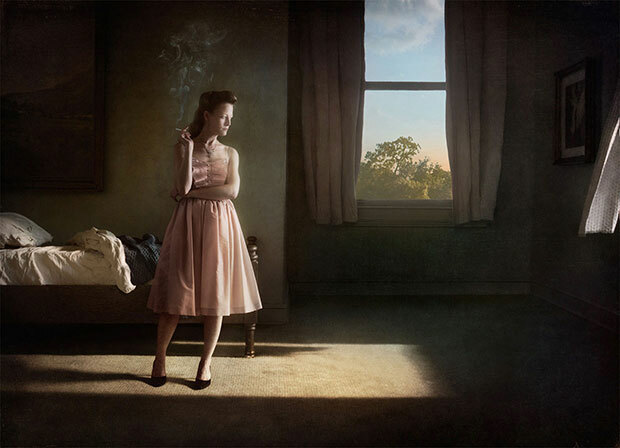 “I wanted to do a series of staged figurative narratives, somehow connected to past art, but also something I could take ownership of. The sets are all painted dollhouse size dioramas that I built and photographed in my studio. A lot of the furniture is standard dollhouse furniture, but some I made myself. I photographed the models against a plain backdrop, and then made the digital composites in Photoshop. This method gives me a great deal of control over every aspect of the process, and I can do it all in my small studio. “The idea of digitally marrying dioramas and live models brings together several of the different working methods I have employed from the past 30 odd years. When I first moved to New York after art school around 1980, one of my first jobs was working in an architectural supply store. The model building materials there inspired me to make a series of miniature painted “stage set like” box constructions. The tone of these was surreal, and a human presence was often suggested by collage or painted shadows, or sometimes an actual painted clay figure. I worked this way for most of the 1980’s. “The introduction of Photoshop in 1990 launched my (ongoing) career as a digital photo-illustrator. Since I have been working in Photoshop almost everyday ever since, I felt confident I had the digital chops to manage the technical part convincingly. I began seriously photographing live models several years ago for my book cover assignments. 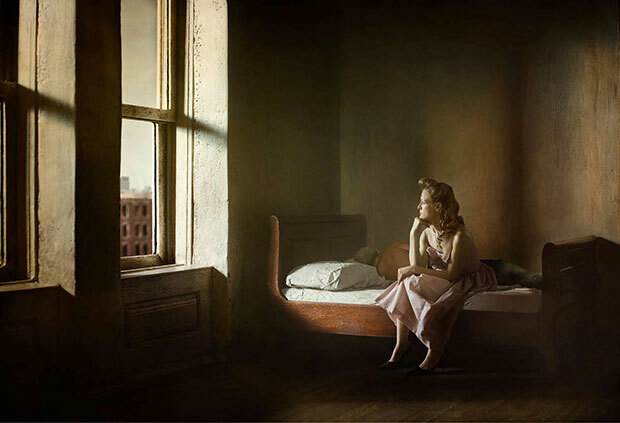 What is it about Hopper that inspired you to make this series? What did you learn about yourself (as a man/photographer) in the making of this work? “Making the dioramas, I learned how much detail and complexity we take for granted in the full-size actual physical world. Photographing the models taught me that I still have a very great deal to learn about lighting and photographing people. Doing the post-production reassured me that I am pretty good at Photoshop, and I have a good eye for detail, but not as good as my printer, Tom White, who is always finding things that I missed.